We all like to think we are good recyclers. Especially anyone born after 1980 when the nascent environmental movement began to gain traction in the U.S. and recycling became more common. At least we like to think we are, anyway! But it can be a challenge sometimes to distinguish between items that can and should be recycled and those types of materials that are probably doomed to end up in a landfill. Yet, there are a very surprising number of common items that really can be recycled. The reality of waste management is that almost every type of material that ends up in the residential waste stream is either recyclable or reusable. While this is the case, many common household materials that make up the bulk of our trash and junk are often disregarded as items that can be recycled. By reducing the quantity of these overlooked materials that do end up going into the household trash, homeowners can add significantly to the recycling efforts in their community. In other words, by intentionally setting aside these items for reuse and recycling, you can be a "strategic partner" with effective junk disposal practices. As you can see in this graphic, not only can we make sure that the common materials we use get recycled from our homes, such as paper, plastic, cans and glass, but with many other common items that can also be recycled or restored through reuse. But what if we find that we have a large amount of junk and unwanted personal belongings we need to get rid of? Maybe it’s large household items like furniture, exercise equipment or lawn care tools. No matter what it is or why you no longer want or need them, you still have to dispose of them. So, why should you consider recycling as opposed to dumping them into the waste stream? Recycling has a significant impact on the environment because it helps conserve up to 95 percent of the fresh water used to process materials, prevents waste from going into the oceans, and it reduces the use of fossil fuel energy which reduces CO2 emissions. The unfortunate reality is that most people simply toss everything out in the trash. That is, if it’s not too big for the trash bin. Otherwise, they will end up being hauled off to the local landfill or, worse, illegally dumped in a vacant field or lot. But as we've pointed out here, simply adding to the municipal waste stream or your local landfill isn't the only or even best option. Because much of what we tend to think of as useless junk or trash can actually be reused or properly disposed of in better ways – such as at your local recycling center. 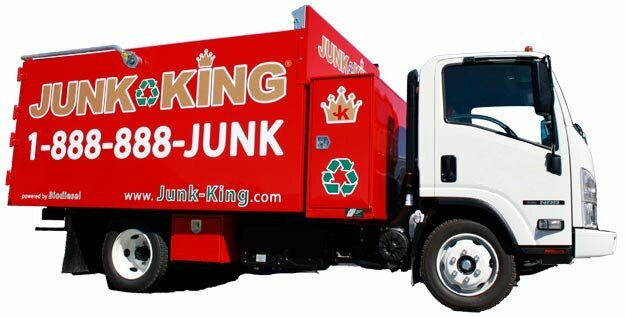 Junk King is proud to be North America’s greenest junk removal service. We pioneered recycling-based junk removal in 2005 and have been going greener ever since. We sort every job for metals, e-waste, paper, household goods, textiles, furniture and appliances, in our recycling warehouses. But “going green” also means we donate, repurpose, and reuse everything from clothing, toys, baby cribs and strollers to office furniture and supplies. We run many of our trucks run on biodiesel, a domestically produced fuel made from more environmentally safe non-petroleum, renewable resources. 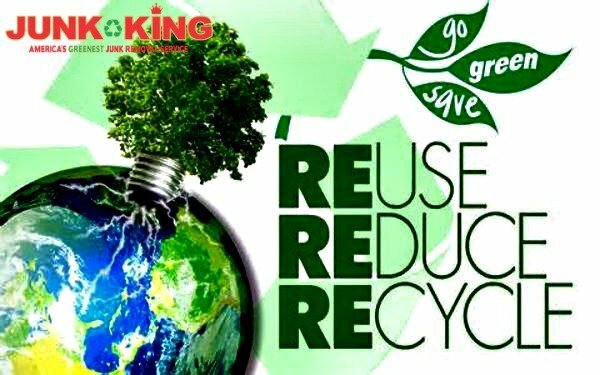 Junk King is committed to continuing to lead the way to help keep our planet clean, green and beautiful for the generations to come. One of the best things about hiring Junk King is that we recycle a much of the material we pick-up. This is proof of our commitment to be an eco-friendly removal service. If you have questions about what we do or what we believe, give us call at 1.888.888.JUNK (5865).